SANA is committed to helping clubs to develop and grow as they, from the smallest group of friends to the biggest association, are the backbone of game angling and also have a vital role to play within the local community. Our aim is to work with clubs and support them in whatever way they wish. We regularly advise on insurance and have recently done so on incorporation. SANA has also published a safety leaflet which can be found here. Any assistance SANA can give will help to ensure the future growth and survival of our clubs and at the same time provide them with the advice and resources to ensure that they can fish in a safe, sustainable environment where they can get the help and encouragement they need and learn more about their environmental, social and legal responsibilities as anglers. call upon SANA for support with any issues you may have with your Club water. We have a network of contacts throughout Scotland in many organisations, including the Government and Marine Scotland. Additionally SANA will promote member clubs through this website and when conducting coaching activities within the area where it is based. Club Membership costs just £75.00 per year. Club membership is limited to clubs, associations, and federations that are based in Scotland. Clubs based in other areas may take out Associate Membership. The secretary of any angling club wishing to join SANA should print off and fill in the Club Membership Form (one with a current date will be posted after the March AGM each year), and send it in together with the current annual subscription, plus a list of the office-bearers of the club and a copy of the club's Constitution and Rules. 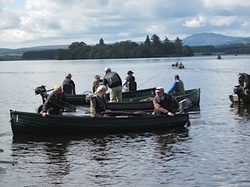 Club/Association membership is open to all angling clubs and associations on production of copy of their constitution and on signing up to the constitution of SANA Ltd.
Club or Association membership confers voting rights at the Annual General Meeting on the basis of four votes per member club/association.